This one is for the serious eater – no more boring bacon and eggs cooked on the gas burner. Get out of your bedchair, and rather get a fire going! You will be able to cook this on a normal braai at low heat, but a kettle braai is preferred. You will have to close these babies up with a lid during cooking time because you won’t be able to flip them. 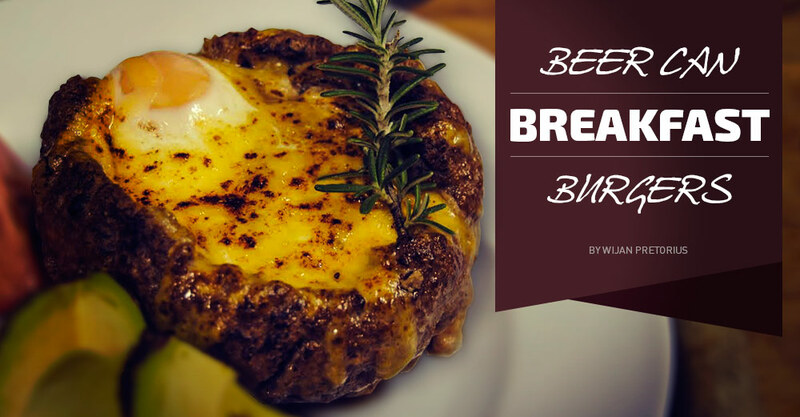 These beer can breakfast burgers are an absolute energy packing meal, using some of my favourite ingredients such as meat, eggs and beer! Have your fire going at a proper rate; lots of flames should do the trick. Warm up a pan over the open flames and add the olive oil – enough to get all the filling ingredients cooked. Chuck your diced onion and red pepper in first, followed closely by the bacon. Fry together until the onions are soft and translucent. Add the mushrooms and move the pan to a cooler section on your grill. The mushrooms will create a bit of water, but remain calm and reduce the juice down to add flavour to your filling. Once the sauce has reduced, add the garlic and chilli. Season with salt and freshly ground black pepper. Remove the pan from the heat, and set aside to let it cool. While the stuffing is busy chilling on the side, mix all the meat-mould ingredients together in a separate bowl. Fold to a malleable consistency and divide into four equally sized meatballs. Turn the closed beer can upside down, dip a piece of paper towel into the cooking oil and wipe the beer can with the oil. This will prevent the beef mince from sticking to the beer can. Now carefully mould a bowl, using the mince, around the beer can. Turn the can right side up, and make sure there are no holes in the bowl – press the mince together to form a tight seal. Remove the mince bowl slowly from the beer can, making sure it stays intact. Repeat this with the remaining meat to form four moulds. Carefully wipe the beer can with a clean cloth, getting rid of any unwanted pieces of raw meat. The beer should technically be cold still, so please open it and have a sip. While quenching your thirst on your choice of brew, fill each little mince bowl two-thirds of the way with the cooled filling. Top with cheese and set aside while you prepare the braai. Make sure you have enough coals to last for at least 45 minutes, but don’t overwhelm the cooking process with too much heat. Once you place the lid onto your kettle braai, we are looking for a constant temperature of approximately 170°C. Move the coals to one side, leaving enough space clear to place the meat bowls onto the grill (don’t have any heat directly under the burgers). Close the braai with the lid, and cook for 30 minutes. Pop the lid open and break an egg into each bowl. Close the lid back up and cook for a further 10 to 15 minutes (depending on how you like your eggs done). Serve these burgers with lovely toasted bread, or if you’re a banter, enjoy them with freshly sliced tomato and avocado on the side.